The Bodines emerged from Glossop in Derbyshire. Fronted by the floppy-fringed Michael Ryan, they became one of the better-known outfits from a crop of jangly indie bands that sprang up around that time. They made their debut with "God Bless", an early release by Creation Records. 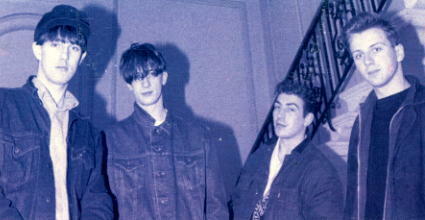 Two further singles followed; their second, "Therese", was included on the famous 'C86' compilation album. Like their contemporaries Primal Scream, the Mighty Lemon Drops and the Weather Prophets, the Bodines went on to sign up with a major label with great hopes of transferring their success to the mainstream charts. The group joined Magnet Records, where a remix of "Therese" became their major label debut. The group's debut album, 'Played' (produced by Ian Broudie, later to enjoy success as a recording artist as the Lightning Seeds) was a fine jangly pop artifact, but it only scraped in to no. 94 in the album charts, in the summer of 1987. Sadly, none of the Bodines' singles for Magnet got into the top 75 (unlike, for example, the Mighty Lemon Drops - there's no justice). Under pressure for failing to deliver the hit record that their major label backers required, the Bodines split up, albeit temporarily. Drummer John Rowland went on to play with The Rainkings. Michael Ryan returned with guitarist Brotherton and a new bassist and drummer in 1989, releasing the jangly single "Decide" on Manchester's Play Hard label and contributing a further new track to the same label's 'Hand to Mouth' compilation. A couple of years later, Ryan reappeared with a new band called Medalark Eleven (mis-named after Harlem Globetrotters' Meadowlark Lemon), assisted by Gareth Thomas on bass and Adrian Donohue (ex-Candlestick Park) on drums. Reunited with Creation Records, they released a couple of singles ahead of 'Shaped Up, Shipped Out', an album of pleasant, if rather unexceptional indie pop. January 2007. Tom Bartlett's Bodines site, Slip Slide, now has a new URL: http://www.bodines.indie-mp3.net.